Apprenticeship training. Total Apprentices vacancies in Tamil Nadu PWD Recruitment are 500 posts. Qualified candidates have to apply for these Apprentices jobs using the TN official Website www.mhrdnats.gov.in. TN PWd application link activates from 22/11/2017 to 11/12/2017. 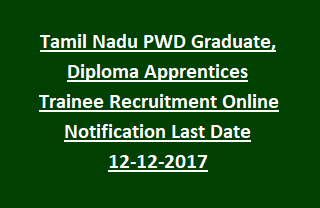 Last date to submit TN PWD Graduate/ Diploma Apprentices is 12-12-2017. Monthly stipend for TN PWD Graduate Apprentices is Rs. 4984/- and for TN PWD Diploma Apprentices is Rs. 3542/-. Candidates applying for Tamil Nadu PWD Apprentices Recruitment vacancies will be shortlisted based on their educational qualification marks and Documents verification. List of shortlisted candidates will be declared on 15-12-2017. Short listed candidates have to appear for Verification of documents from 20-12-2017. Further Selection Procedure, Application Process, Age limits, Monthly Stipend, Educational Qualification details regarding Public Works Department, Tamil Nadu TN PWD Recruitment 500 Diploma/ Graduate Apprentices govt vacancies are given below. Verification of certificates: 20-12-2017 onwards. Total Apprentices vacancies in Tamil Nadu PWD Public Works Department recruitment are 500 posts. Training duration is 1 year. Graduate Apprentices: Degree in engineering or technology in relevant discipline from a statutory University or Institution. Diploma Apprentices: Must hold Diploma in Technology/ Engineering in relevant stream from the state council/ Board of Technical Education established by State govt. For further qualifications see the Tamil Nadu PWD official notification. Age of the candidates for TN PWD Diploma/ Graduate Apprentices Recruitment is applicable as per Apprenticeship rules. Candidates for Tamil Nadu PWD Graduate/ Diploma Apprentices Trainees selection is based on candidate marks obtained in qualifying Examination and Interview/ Documents verification. Verification of certificates starts from 20-12-2017 onwards. Interested candidates fulfilling essential qualifications have to apply for Tamil Nadu Apprenticeship training posts have to go through www.mhrdnats.gov.in. Complete the application process and submit Tamil Nadu PWD apprentices Jobs before 12-12-2017. Application forms available from 22-11-2017 to 11-12-2017.